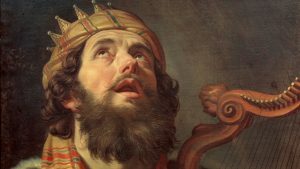 David, the second Jewish king lived a thousand years before Christ. He was a man who faced tremendous stress in his life. Few of us today will face the kind of anxiety David experienced for more than 10 years of his life when he was constantly on the run from his enemies who were trying to kill him. His psalms reveal keys that unlock powerful solutions even for today’s high stress world. One of the realities of life that our current physical science-based medical system has had to admit in recent years is that there are non-physical causes to poor health and disease. One widely accepted non-physical cause is “stress.” It’s quite well known today that the presence of stress in one’s life, and how one deals with that stress, has a direct impact on one’s health. Unfortunately, the solutions the medical system most often prescribes today for mental and emotional health are expensive drugs with serious side effects. So many people are “stressed out” that anti-depressant drugs have become a growing and prosperous business for pharmaceutical companies. Notice the signs of stress he wrote in that Psalm: “My thoughts trouble me and I am distraught… My heart is in anguish within me; the terrors of death assail me. Fear and trembling have beset me; horror has overwhelmed me.” If David confessed these feelings to a psychiatrist today, he would have been prescribed anti-depressant drugs immediately to try and stabilize his emotional condition. He had all the signs of “mental disease” including the temptation to try and escape from all of his problems by running away from them: “Oh, that I had the wings of a dove! I would fly away and be at rest—I would flee far away and stay in the desert; I would hurry to my place of shelter, far from the tempest and storm.” He was unstable, neurotic, and desperate. He would probably be labeled as “insane” today and be committed to a mental health hospital. What was David’s solution to his enormous stress? David did not seek out physicians in his anxiety. He appealed to God for help, trusting that God would hear his prayers and change his condition. If you read the psalms of David you will notice that David consistently took two approaches to dealing with anxiety and stress. Both approaches involved prayer and a personal relationship with his Creator. As strong and powerful as David was, in many circumstances he was powerless against his enemies and the rulers of his day. But he knew first hand that God was not powerless, and so he appealed to God to intervene. David cast all of his worries and cares on God. He trusted in Him to take care of them all, and to sustain him with strength to endure everything. These two ways of using prayer to deal with stress are just as relevant to us today. We are in the age of the New Covenant – Instituted by the death and resurrection of Jesus Christ. The believers in the early church were often arrested and persecuted, suffering tremendous stress. The same two principles were used to deal with their anxiety and stress. Principle 1 – pray for God to intervene in the stressful situation. These are the two biblical principles for dealing with anxiety and stress, and they are the guiding principles for mental health. No drugs are needed but there is a requirement. It requires a relationship with God through Jesus. And this is not just an intellectual knowledge about him. So the first step is the spiritual rebirth. That’s something we need to seek and find for ourselves. How do you deal with anxiety and stress? The two principles written about here are time-tested principles that have been used for thousands of years, long before modern-day pharmaceuticals came into the market place with our current medical system. They are backed by a guarantee from the Creator himself, the one who formed and fashioned you while still in your mother’s womb. Best of all, they are free! Do you want a prescription for drug-free mental health?